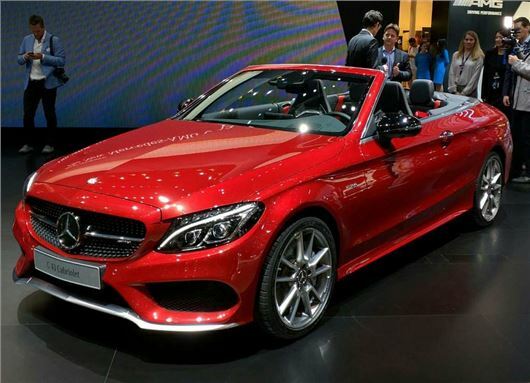 Mercedes-Benz has pulled the wraps off the C-Class Cabriolet at the Geneva Motor Show. It's the first time that there's been a drop-top version of the popular C-Class and it's based closely on the coupe, albeit slightly taller and with a longer rear deck. It's a full four-seat convertible and sitted with a fabric roof. That means the roof can fold much faster than similar cars with a metal roof - it'll come down in less than 20 seconds at speeds of up to 31mph. Power comes from the same engines as you'll find in the C-Class Coupe. That means two diesels, the C220d (168bhp) and C250d (201bhp). The C220d is good for 62.7mpg and 116g/km on paper and has a 0-62mph time of 8.3 seconds, and has a top speed of 144mph. The C250d does 0-62mph in 7.2sec, and returns an official fuel consumption figure of 61.4mpg. Petrols are a C180 with 154bhp, with the C200, C250, C300 and C400 offering up to 328bhp. C400 is the hot one, reaching 62mph in 8.0sec, and emitting 181g/km of CO2. Then there's the C43 4Mati range-topper. It gets the 3.0-litre V6 petrol engine with 362bhp, capable of 0-62mph in 4.8sec. It gets an AMG bodykit and small interior tweaks.